Wanted to color Home or Office? We are offer Painting services in Lahore. Our Professional servicemen and partners do their Job hard work and dedication. 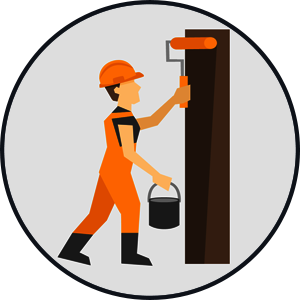 Our qualified professionals can paint new buildings, offices and maintain them(whitewash). so if you are building new home, office or upgrading/repairing buildings, The Homeservicemen is ready to serve you. Charge at very cheap and competitive prices. We are also offering Electrical, Plumbing, and HVAC Services. Please see our Prices page for a full list of our service details). 1) Either you can pay for labor only and provide your own paint/materials. a. Non-Member clients, minimum order charges are Rs. 500. you will be minimum charged Rs 500.
b. For Non-Member clients residing, minimum order charges are Rs. 800. you will be minimum charged Rs 800. Paint services will be provided by our partners. New paint for a fresh wall that has never been painted before and requires wall putty & scraping with sandpaper. Repaint is for walls that have had paint before and just need to be repainted.